Viking Dog Training is a small business that specialises in one to one dog training. In home training for dogs and boarding and training service. Dogs and people can live together in a happy and positive relationship. But your dog needs to understand the rules of the house and requires boundaries to help them live in harmony within your environment. That's how I came across Viking Dog Training. I got my poodle puppy in December 2012 and quickly realised that I needed help in training. So I got in touch with Marianne Hovde, owner of Viking Dog Training. I wanted a trainer who could come to me, on the Northside of Brisbane and help Rocket and I to work together as a team. I needed an expert in puppy training and Marianne was a delight to work with. Rocket adored her. Marianne taught both Rocket and I about impulse control training, positive rewards for preferred behaviour and many simple fun recall games that Rocket absolutely loved. Engaging Marianne was the best decision I made for training my new puppy. Rocket enjoyed the rewards based training and Marianne was so good with getting his attention. She helped me to learn the right cues when working with Rocket. Viking Dog Training now specialise in boarding and training your dog. This is a great opportunity to have your dog stay with Marianne for an agreed period of time, where she will work with your dog to train them. Dog boarding and training is one of the fastest ways to train a dog, and it is a great solutions for owners who are going away or are time poor. The dog stays with Marianne in her home and she treats them like one of her own dogs. Your dog would sleep in a crate at night or one of the spare rooms that have been specially set up for this boarding purpose. Boarded dogs are put on the same raw meat diet that Marianne feeds her own dogs. However, if your dog has a sensitive stomach or food allergies, you can bring their food along so that they do not get an upset tummy during their stay. The dog will learn general good manners, basic obedience, such as walking on a loose leash, coming when called, crate training, house manners and impulse control. All training is positive reward based and the dogs love it. Marianne takes a pragmatic approach and advises that there is no restriction on breed that can participate in boarding and training. However, not every dog will be suitable for boarding and training. For example, some dogs are very fearful, they may have separation anxiety, or other such issues. It is best to discuss your particular dog's needs with Marianne to make an informed decision. This is a specialty service and high demand, so make sure you touch base with Marianne to see if she can fit your four-legged friend in. Training sessions are $90 for one hour. However, there are multiple training packages available. Boarding and Training costs are best discussed with Marianne to ensure your dog meets the criteria. Prices are available at Viking Dog Training website. 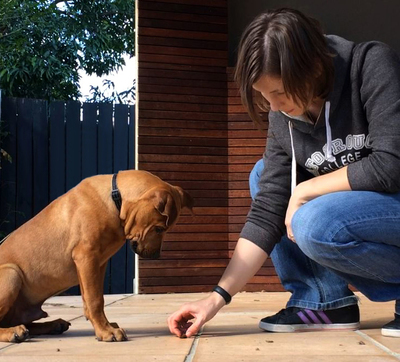 Viking Dog Training is a professional dog training service based on the northside of Brisbane. It is owned by Marianne Hovde who is an NDTF certified dog trainer. Marianne trains all types of dogs and puppies around the areas of Pine Rivers, Redcliffe, Caboolture and northern Brisbane, QLD. She is very observant and I found her training to be incredibly effective. She works with owners and their dogs on obedience training, such as walking on a loose leash, coming when called and general manners and more. Marianne helps many dog owners to manage or fix problem behaviour, such as aggression, anxiety, barking, digging, and separation anxiety. So, if you need assistance with problem behaviour, get in touch with Marianne to see if she can help you out. For more information about contacting Viking Dog Training, go to the website. To book in for training, go to the Viking Dog Training Booking Request Form. Viking Dog Training also have a Facebook page where you can see photos of the many dogs she has trained, read testimonials and receive tips and hints on positive dog training too.